Naruto, in the northeastern part of Tokushima prefecture, was formed in 1947 by uniting Muya town, Okazaki port, and some surrounding islands. Today, Naruto has a population of about 60,000. Most visitors to Naruto come to see the amazing whirlpools in the Naruto Strait, either up close from a boat or from a boardwalk called Uzu no Michi that was constructed under the bridge that connects Shikoku and Awaji Island. Nowadays hundreds of thousands of people from around Japan and around the world come to see the whirlpools and to visit other sites in the Naruto area, including the Otsuka Art Museum, Otani pottery studio, and Temple 1, Ryōzen-ji and Temple 2, Gokuraku-ji along the Shikoku pilgrimage route. Another significant attraction of Naruto, which at its peak in popularity attracts more than 50,000 people every year, is a giant-kite flying event. 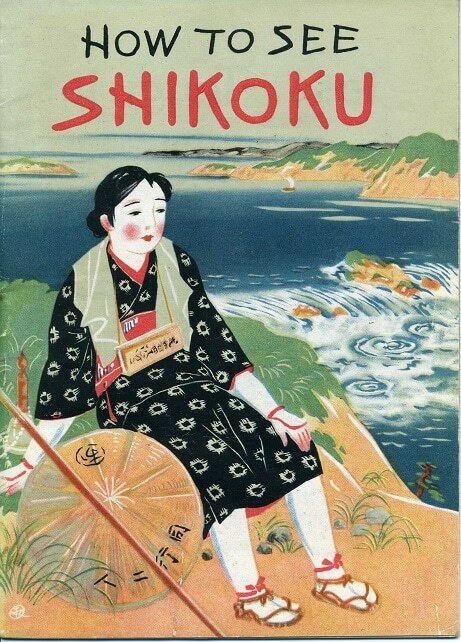 An eleven-page pamphlet entitled “Shikoku”, produced by Japan Tourist Bureau in 1936, states, “Apart from the industrial viewpoint, Muya has an attraction all its own – giant kites borne on the gale in summer at the beaches. The biggest of these kites measures more than sixteen meters in diameter and weighs about 4,000 kilograms. It takes 200 adults, it is said, to fly each kite.” In 1947 a similar pamphlet was published with a similar description, “Kite flying is a No. 1 attraction in the annual calendar of Naruto…. The flying season is in July and August when the strong wind prevails.” Then the “Japan – The Official Guide,” published in 1961, states, “An interesting annual kite-flying festival was formerly held in Naruto City. It originated more than 200 years ago at the time of the reconstruction of the main hall of Rengeji Temple … More than 1000 kites … were flown.” Unfortunately, there is no mention of the event in either the 1966 or 1975 guidebooks on Japan or any time after that. 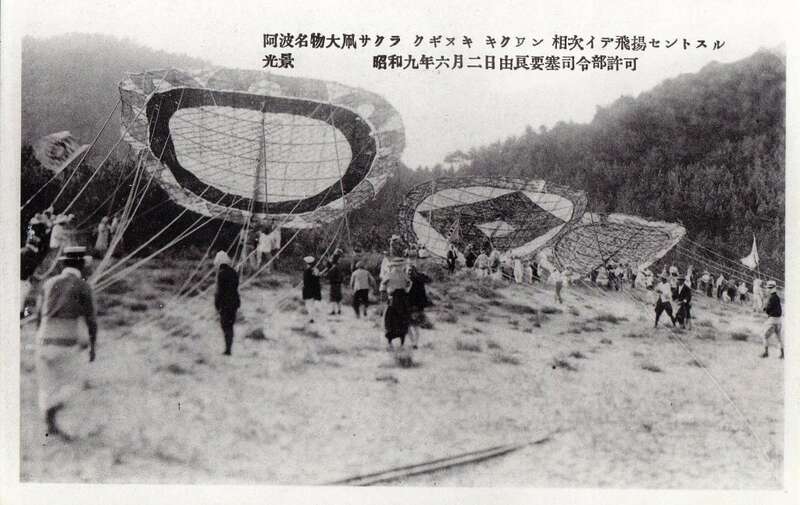 Fortunately, Japanese source materials provide more information about these kites and the history of this event. One reference states that these circular kites called Wan Wan Dako (わんわん凧) originated in 1692 when the framework of the new main hall of Rengeji (蓮花寺) was completed. 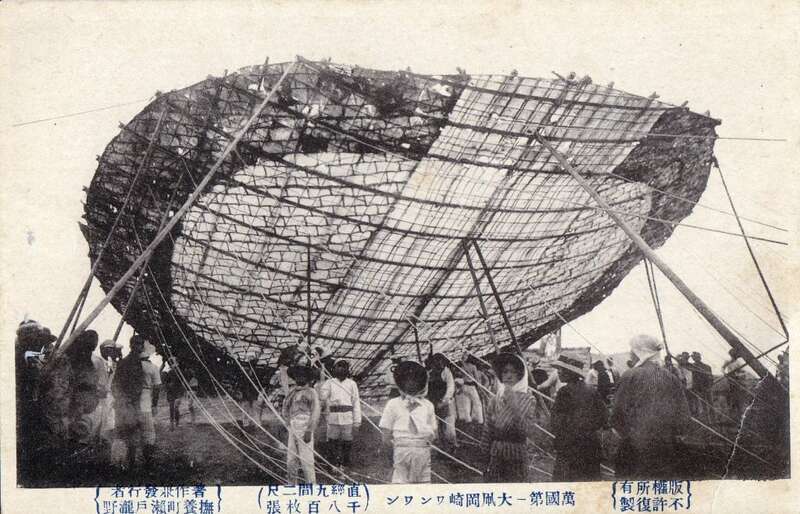 The master carpenter, to celebrate the work on the temple, made a circular kite like a round (wan) bowl with fifty sheets of paper each measuring 32cm x 47cm. After this there are no references to the kites until the early 1900s, and later in 1934-1936 when so many people wanted to see the 100+ giant kites flying that a temporary bus service was set up to transport people between Muya train station and Oote beach where the event was held and businesses in town closed for the day in order to allow everyone to go. During World War II the event was not run and despite efforts made after the war to revive the event and despite a surge in interest in kites during the 1960s, interest slowly dissipated and it was stopped. However, in 1999 a 26-meter diameter kite was built as an attempt to get it recognized as the World’s Largest Kite for the Guinness Book of World Records. In 2008 an eight-meter kite was constructed and flown and in 2010, this tradition was designated as an Intangible Folk Cultural Property. Smaller events have been held since then, for example, on January 1, 2013, 2014 and 2015 a 3 to 4-meter kite was made and flown to celebrate the coming of the New Year, but only about 100-150 people attended. In 2014, students at Naruto high school received help from members of the Naruto Large Kite Preservation Group (鳴門大凧保存会) to create a three-meter kite. 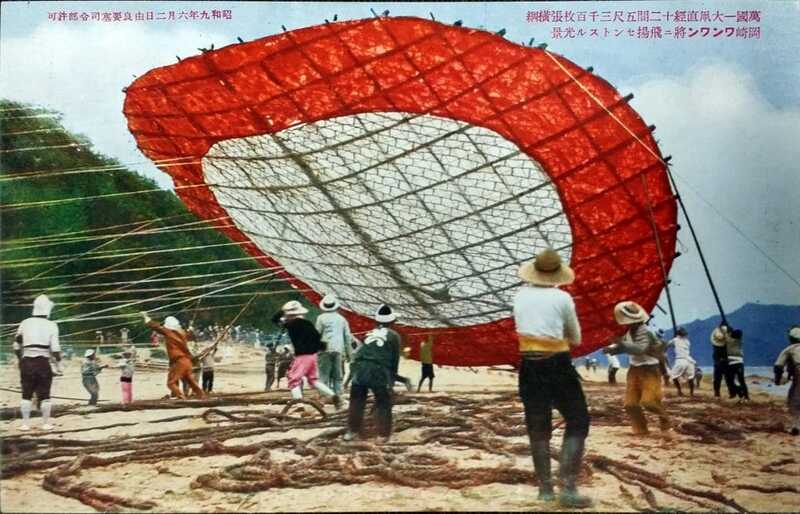 While kite-flying events and workshops on how to make mini wan-wan kites are still held by this Preservation Group, the scale of the event continues to decrease because the group members are elderly and there are few who know how to make these giant kites. This article was first published in the September 2015 issue of Awa Life.